I got home this evening to discover that in the last two weeks, the garden has exploded. Here's my formerly skimpy California natives bed, bursting at the seams. 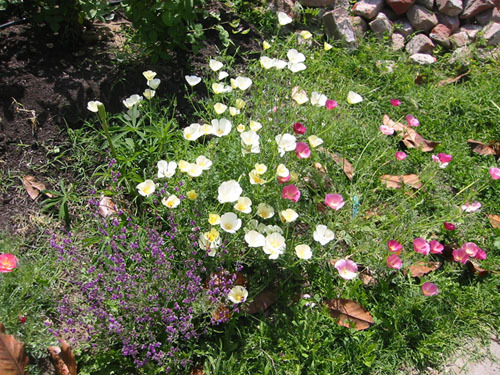 Check out all the weeds being crowded out by that out-of-control poppy. In the back, weeds have grown large and lush alongside the plants (in fairness to Noel, who has been left with push hoe and vague instructions, it can be hard to tell what is a weed and what is a plant when you are not a plant person). I have my work cut out for me back there. 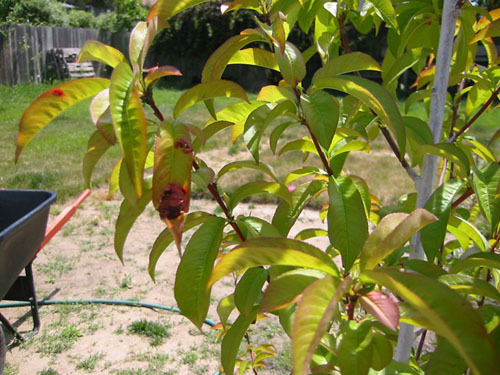 The orchard is doing well, except for one of the nectarines which is showing the classic signs of peach leaf curl. The only cure is spraying it before buds emerge; once the curl shows up the plant is infected and that is that. Fortunately, this tree has nothing to do this year but get established; I'm not expecting it to use any energy making fruit. I'll spray it next year. 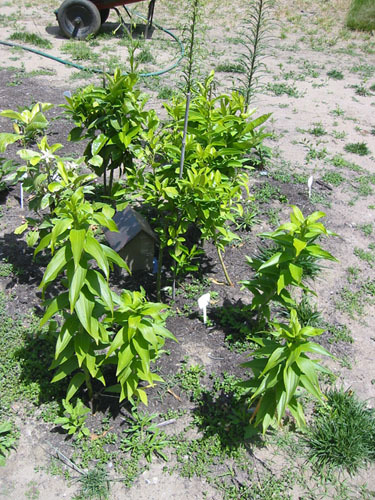 Here's a puzzle: which of these are lilies, and which are the citrus trees? This combination worked out to be so funny to me that even though I decided earlier in the season that I wanted to move the lilies elsewhere, I almost can't bear to give up the joke. I know it's not a terribly funny joke, but I smile every time I see them. I picked five baby lemons off the over-acheiving lemon, too. Stupid tree. Out front the news is all good: the rose hedge is blooming like mad. 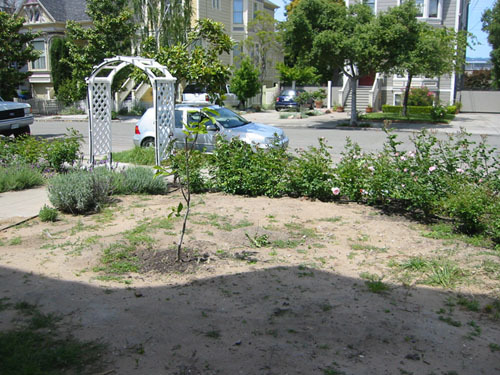 More weeding to be done, and we're planning to put some hurting on the Bermuda grass in the open areas Saturday afternoon, but the roses are all looking healthy, the violets planted under them are insanely happy, and I found a bunch of little lavender seedlings while pulling some larger weeds. I do love these big English roses. 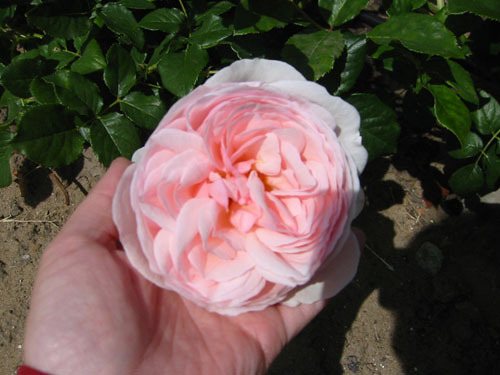 They look lush and lovely, they smell wonderful, and they just seem to be healthier than the standard tea roses. I think they fit the era of the house nicely (though of course they are all recent hybrids) while not being too-too period. 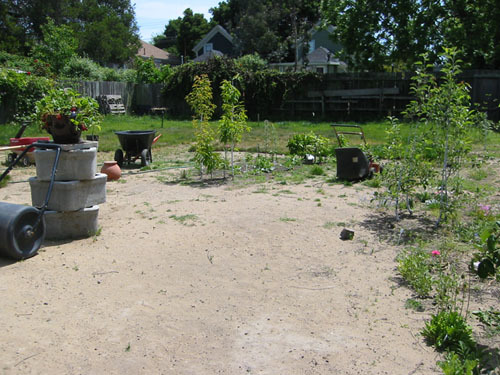 The garden is making the transition from spring to summer, which means no more rain around here until October. I am working semi-obsessively on making it artificially spring all year round with the irrigation system, but until all is installed and in place, everything (apart from the roses) has to be watered by hand. With me away at school, that's been a heavy burden on Noel, so we both have an incentive to get the irrigation installed and operating.